The Mercedes Benz SL-Class W198 Series. Is a sport car with coupe and roadster body that was manufactured between 1954 and 1957. Initially it was manufactured with a coupe body and then as a convertible, the 300 SL being one of the first super sports cars in the history of the automobile. He has been known by the nickname of "widow maker" as a result of which many pilots died when they crashed while driving and for their distinctive gull-wing doors. It was the first car to assemble a gasoline engine with direct fuel injection. Mercedes Benz SL-Class W198 Series (1954-1957) There is 1 product. 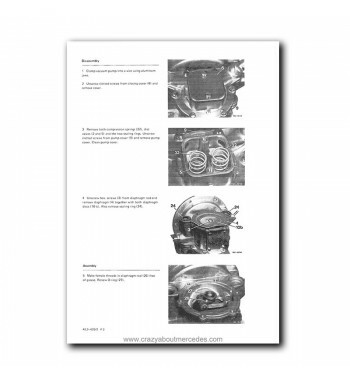 Program with basic technical information of repair manuals, maintenance and user of Mercedes Benz cars W100, W113, W121 and W198 Series manufactured between 1954 and 1972.